1/2 Gallon: Jojoba Herbal Massage Lotion offers your clients the very best in skin nutrition without the scent. 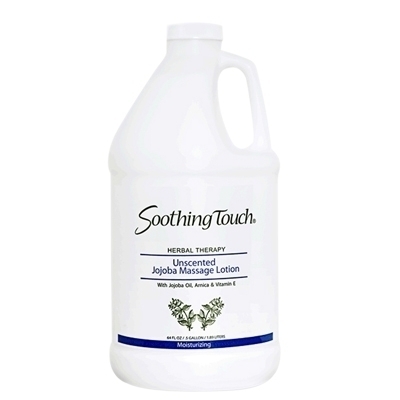 Smooth and effortless to apply, this lotion is perfect for deep tissue work, reflexology or when you are looking for a little more absorption. Enhanced with Jojoba Oil, Arnica, Aloe, Herbal Infusions and vitamin E this lotion gives the massage therapist the perfect glide for the perfect massage. Unscented - Non Greasy - Water Dispersible - Washes From Sheet. Dimensions: 7" x 6" x 6"